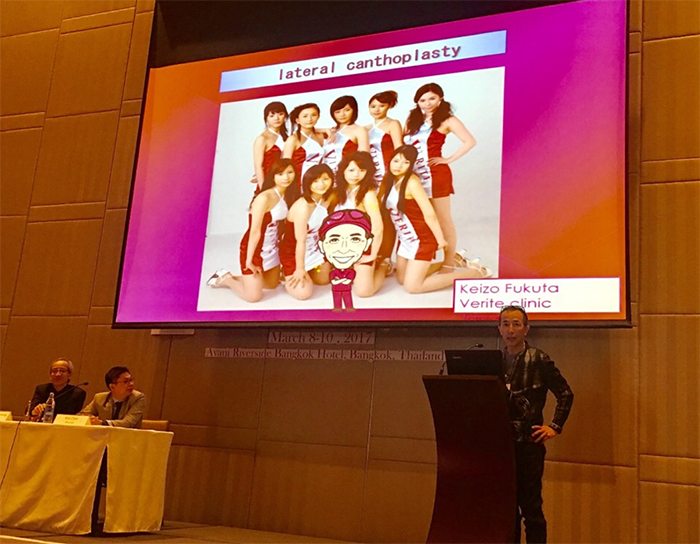 There are increasing demands for lateral canthoplasty in Asian cosmetic surgery. We have often seen the cases that had lateral canthoplasty in other clinics. I have found the most popular procedure they received is the von Ammon method. We also used the von Ammon method. he lateral canthus is simply incised horizontally and sutured between skin and palpebral conjunctiva. This procedure leaves a grey line defect at both upper and lower eyelids. We reviewed our patients on whom we performed the lateral canthoplasty. 25 cases with follow-up period more than 3 months were included in the study. The length of full thickness horizontal incision was 3 to 5 mm (3.8mm in mean). The horizontal extension achieved was 1.2 mm in mean. The maximum elongation among them was 2.5 mm. The horizontal elongation was less than 0.5 mm in 8 cases. The enlargement of the lateral sclera was 20 % up from the preoperative size. This expansion occurred mainly because of the downward shift of the lower lid margin. Besides, the lateral corner became round in the up-right position. If the horizontal full-thickness incision is long to achieve greater effect, the palpebral conjunctiva will be pulled out and exposed at the lateral corner. After this study, we have become skeptical to the lateral canthoplasty. We make the horizontal incision conservatively. Since 2016, I have used the method presented by Dr. Chae (Arch Plast Surg. 2016 Jul;43(4):321-327.9). My limited experiences with this method are to be presented in this paper.